Adam Lallana came off the bench to score the winner as Southampton progressed to the fourth round of the Carling Cup by beating Preston. Jos Hooiveld had put Saints in front with a first-half header. Adam Barton levelled for Preston after the restart when he pounced on a loose ball after Bartosz Bialkowski failed to hold a Darel Russell shot. But Lallana stooped to convert a Lee Holmes cross to seal a deserved victory for the Championship leaders. The home side made 10 changes to their starting line-up following the weekend's impressive 4-1 demolition of Birmingham in the league. It was one of the new faces, teenage academy product Ben Reeves, who made the opener, flicking on a corner to provide Dutch defender Hooiveld with a straightforward header. The Saints dominated for large spells, and it was against the run of play when Preston scrambled an equaliser in the second half. Goalkeeper Bialkowski failed to deal with a Russell effort from outside the box, and the enterprising Barton was on hand to steer the rebound home. 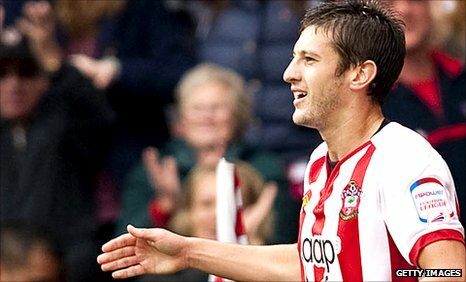 But Lallana's header, two minutes after coming on for Steve de Ridder, sealed the result for Southampton. The versatile midfielder started and finished a slick move, nodding a pinpoint cross past Preston keeper Andreas Arestidou after 66 minutes. Preston boss Phil Brown, who himself had made 10 changes to his side, threw on in-form forward Neil Mellor with 10 minutes to go in a desperate attempt to create a goal and force extra time. However the former Liverpool striker was unable to create an opening as Southampton closed out the tie. 90:00+4:27 The referee blows for the end of the match. 90:00+3:32 Foul by Richard Chaplow on Ian Ashbee, free kick awarded. Darel Russell takes the free kick. Juvhel Tsoumou is caught offside. Bartosz Bialkowski takes the indirect free kick. 90:00+2:50 Corner from the left by-line taken by Danny Mayor, Adam Lallana manages to make a clearance. 90:00+2:25 Effort on goal by Adam Lallana from just inside the penalty area goes over the target. 90:00+1:22 Effort on goal by Danny Mayor from outside the penalty box goes harmlessly over the bar. 89:18 Booking Darel Russell receives a yellow card. 87:53 Free kick awarded for an unfair challenge on Neil Mellor by Jose Fonte. Direct free kick taken by Darel Russell. 86:42 The offside flag is raised against Juvhel Tsoumou. Free kick taken by Bartosz Bialkowski. 86:06 Direct free kick taken by Richard Chaplow. 86:06 Booking The referee shows Bailey Wright a yellow card for unsporting behaviour. 85:54 Bailey Wright gives away a free kick for an unfair challenge on Richard Chaplow. 81:25 Lee Holmes challenges Bailey Wright unfairly and gives away a free kick. Danny Mayor takes the direct free kick. 79:33 Unfair challenge on Danny Mayor by Danny Butterfield results in a free kick. Ian Ashbee restarts play with the free kick. 77:59 Free kick taken by Bartosz Bialkowski. 77:59 Substitution Jonathan Forte leaves the field to be replaced by Richard Lambert. 77:59 The assistant referee signals for offside against Juvhel Tsoumou. 77:09 Free kick awarded for a foul by Danny Mayor on Morgan Schneiderlin. Free kick taken by Danny Butterfield. 74:56 The official flags Neil Mellor offside. Free kick taken by Bartosz Bialkowski. 74:09 Substitution Neil Mellor on for Seanan Clucas. 73:55 Jonathan Forte takes a shot. Save made by Andreas Arestidou. 73:11 Darel Russell concedes a free kick for a foul on Morgan Schneiderlin. Ryan Dickson takes the direct free kick. 70:32 Ryan Dickson crosses the ball, Andreas Arestidou makes a save. 68:29 Substitution Clarke Carlisle joins the action as a substitute, replacing Steven Smith. 66:08 Substitution (Southampton) makes a substitution, with Jose Fonte coming on for Jos Hooiveld. 65:28 The assist for the goal came from Lee Holmes. 65:28 GOAL - Adam Lallana:Southampton 2 - 1 Preston Adam Lallana grabs a headed goal from inside the area. Southampton 2-1 Preston. 63:47 Substitution Adam Lallana comes on in place of Steve De Ridder. 63:47 The ball is sent over by Danny Mayor. 63:05 Free kick awarded for a foul by Richard Chaplow on Darel Russell. Direct free kick taken by Steven Smith. 62:20 Unfair challenge on Richard Chaplow by Juvhel Tsoumou results in a free kick. Free kick taken by Jos Hooiveld. 61:27 Morgan Schneiderlin fouled by Darel Russell, the ref awards a free kick. Danny Butterfield takes the free kick. 60:38 The referee blows for offside against Juvhel Tsoumou. Indirect free kick taken by Aaron Martin. 57:52 Steve De Ridder produces a cross. 56:57 Lee Holmes takes a inswinging corner to the near post, Ian Ashbee manages to make a clearance. 55:49 David Gray challenges Ryan Dickson unfairly and gives away a free kick. Lee Holmes crosses the ball in from the free kick. 55:09 Lee Holmes delivers the ball, Steven Smith makes a clearance. Correction - 51:17 GOAL - Adam Barton:Southampton 1 - 1 Preston A goal is scored by Adam Barton from deep inside the penalty area to the bottom left corner of the goal. Southampton 1-1 Preston. Correction - 51:12 Darel Russell takes a shot. Save made by Bartosz Bialkowski. 51:12 Darel Russell takes a shot. Save by Bartosz Bialkowski. 50:17 GOAL - Adam Barton:Southampton 1 - 1 Preston Adam Barton fires in a goal from inside the penalty area to the bottom left corner of the goal. Southampton 1-1 Preston. 50:13 Bailey Wright fouled by Jonathan Forte, the ref awards a free kick. Craig Morgan takes the free kick. 48:36 Steve De Ridder crosses the ball. 46:49 Unfair challenge on Lee Holmes by David Gray results in a free kick. Morgan Schneiderlin takes the free kick. 45:57 Steven Smith produces a cross, save made by Bartosz Bialkowski. 45:27 Foul by Jonathan Forte on Bailey Wright, free kick awarded. Direct free kick taken by Bailey Wright. 45:01 Substitution (Preston) makes a substitution, with David Gray coming on for Keammar Daley. 45:00+3:10 The ref blows to signal half-time. 45:00+1:28 Free kick awarded for an unfair challenge on Darel Russell by Richard Chaplow. Steven Smith takes the free kick. Steven Smith takes a shot. Save made by Bartosz Bialkowski. Outswinging corner taken by Steven Smith from the left by-line, Close range headed effort by Juvhel Tsoumou goes wide of the left-hand upright. 43:03 Effort from just outside the box by Steve De Ridder goes over the bar. 39:10 Free kick awarded for a foul by Juvhel Tsoumou on Jos Hooiveld. Direct free kick taken by Jos Hooiveld. 37:42 Foul by Jonathan Forte on Darel Russell, free kick awarded. Direct free kick taken by Steven Smith. 33:07 Ben Reeves has an effort at goal from outside the area missing to the wide right of the goal. 32:23 Corner taken left-footed by Lee Holmes. 31:39 Shot from 30 yards from Jos Hooiveld. Andreas Arestidou makes a save. 29:43 Ben Reeves produces a left-footed shot from just outside the area that goes wide left of the goal. 28:20 Steve De Ridder takes the inswinging corner, clearance by Seanan Clucas. 26:38 Assist on the goal came from Ben Reeves. 26:38 GOAL - Jos Hooiveld:Southampton 1 - 0 Preston Jos Hooiveld scores a headed goal from close in. Southampton 1-0 Preston. 25:47 Inswinging corner taken left-footed by Lee Holmes from the right by-line. 25:01 Danny Butterfield takes the direct free kick. 25:01 Booking The referee shows Seanan Clucas a yellow card for unsporting behaviour. 24:52 Foul by Seanan Clucas on Steve De Ridder, free kick awarded. 24:09 Inswinging corner taken from the right by-line by Steven Smith, clearance by Danny Butterfield. 23:33 Juvhel Tsoumou takes a shot. Bartosz Bialkowski makes a save. 21:38 Danny Butterfield restarts play with the free kick. 21:38 Booking The referee books Steven Smith for unsporting behaviour. 21:30 Unfair challenge on Steve De Ridder by Steven Smith results in a free kick. 20:15 Shot by Ben Reeves from outside the box goes over the net. 19:24 Ryan Dickson gives away a free kick for an unfair challenge on Keammar Daley. The free kick is swung in left-footed by Steven Smith, clearance made by Aaron Martin. 16:49 Ryan Dickson sends in a cross, clearance made by Craig Morgan. 16:03 Handball decision goes against Steve De Ridder. Steven Smith takes the direct free kick. 11:33 The referee blows for offside. Indirect free kick taken by Andreas Arestidou. 11:12 Ian Ashbee gives away a free kick for an unfair challenge on Morgan Schneiderlin. Danny Butterfield restarts play with the free kick. 8:43 A cross is delivered by Keammar Daley. 8:07 Ryan Dickson concedes a free kick for a foul on Keammar Daley. Keammar Daley takes the direct free kick. 6:02 Free kick awarded for a foul by Seanan Clucas on Lee Holmes. The free kick is delivered right-footed by Steve De Ridder from left wing. 5:04 Centre by Lee Holmes, Bailey Wright makes a clearance. 4:39 Richard Chaplow fouled by Danny Mayor, the ref awards a free kick. Richard Chaplow takes the direct free kick. 2:04 Shot on goal by Jonathan Forte from just inside the area clears the crossbar. 1:27 Jonathan Forte is caught offside. Indirect free kick taken by Andreas Arestidou. 1:04 Free kick awarded for an unfair challenge on Richard Chaplow by Ian Ashbee. Jos Hooiveld takes the direct free kick.